When Henry Ford II decided he wanted to win Le Mans, he tried to buy Ferrari. He almost succeeded but Enzo Ferrari changed his mind at the last moment. The only other option was for Ford to build a European car, firstly to win Le Mans and secondly to show Ferrari that Ford did not need them. This led to the birth of the Ford GT 40. The cars were made in Britain and they had to have all the teething problems ironed out of them before they could achieve victory at Le Mans. The car was known as a GT 40 because it was 40 in (102 cm) high. The first victory was followed by others and Ferrari were forced to watch Ford's success. All three Ford GT 40s had retired in 1964 and the first three places were taken by Ferrari and there was no success for Ford the following year when six GT 40s were forced to retire and the first three places were once again reserved for the cars from Modena. But by then Ford turned the corner. Ford sent thirteen GT 40s to Le Mans in 1966 and although ten failed to go the distance, the other three came first, second and third. 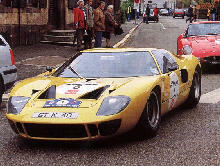 Ford took first and fourth the following year and the race was won by a GT40 in 1968 and 1969. Ford had proved that its British colleagues could build fine cars. 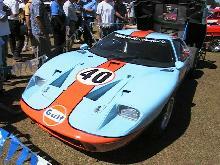 A number of the GT 40s made were detuned for road use but they were not really suitable as road cars. The engine was mounted in front of the rear axle in the centre of the car and was 4,727 cc.